We’ve received various tips this month regarding T-Mobile’s upcoming changes to its retail stores. Primarily, they revolve around a new uniform for the company’s staff. Instead of wearing smart black “dress” pants/slacks, staff will be required to wear black or blue jeans. In one of our sources own words: “They are traditional “work-specific” jeans, so no tears, cuts, fade, studs, etc. Needs to fit properly around waist and be proper length for professional attire.” In other words, no baggy ripped jeans hanging around your knees. Staff are required to purchase their own jeans, in their own time and won’t be reimbursed. For some, this will be no problem. Some of us like shopping for new attire. And personally, if T-Mobile UK had gone with these changes when I worked for them, I’d have jumped at the opportunity to get out of my uncomfortable and “professional” uniform. But not everyone is average height and size, so finding well-fitted jeans can pose a problem. The date this change takes effect: April 11th, of course. The date everything seems to be happening this month at T-Mobile. 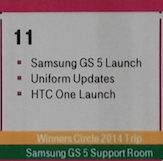 We’ll also see the launch of the Galaxy S5 and HTC One M8. More excitingly, we’re being told that T-Mobile has been rolling out a mobile POS system whereby store staff can complete transactions using iPads, similar to how Apple retail works (with iPads instead of iPods). Our source tells us they’ve been rolling out the equipment installation in stores on Long Island, NY. We’ve not seen any official images, or memos on this particular change, so for now, take it with a pinch of salt. It could just be an early test, to see how it plays out in real life. ← Uncarrier 5.0 incoming, but what will it be? The funny thing is they have 2 checkout and small stores around me. So why would the 2 people working need a POS? Black jeans…only if they’re acid wash! I wish this was an April Fool’s. So T-Mobile will be the most ‘casual’ carrier? If you think slacks and a polo is too much I can only imagine how’d you feel having to wear a suit to work everyday like me. I can’t think of any corporate retail location in which they’re forced to wear jeans. Most ridiculous news I’ve heard from TMo yet. Forced to wear jeans? Because polos and black pants are too much? Oh boy, I’m afraid to think about what happens if these people are forced to wear suits. Less professional attire = worse for brand image and impression on customers. Oh and instead of wasting money on stupid iPads for POS, why don’t they work with the perfectly good equipment they already have (including the self serve payment kiosks that they just rolled out) and remit that money towards coverage enhancements, That should be their number 1 PRIORITY! I actually like their black on black look. The black bottoms should always be black kakhi type pants, not jeans, and the tops should be an alternating black, white, or magenta polo shirt. Each employee gets one shirt of each color and can alternate daily or every other day or wear one color all the time. Exactly! Very bad for brand image. Horrible impression on customers. Looks sleazy. Because Apple had such a hurting when they sell in jeans? Who cares what they wear? The 80’s called, they want their stores back. They are trying to make their store more like Apple. Apple employees wear T-shirt and jeans and use iPhone POS devices. They are actually iPod Touch’s not iPhones. No I agree with you, I think it’s great. Unless you work in one, you don’t realize how much of a barrier it can be for customers to a) See staff all standing behind a counter and b) Wearing formal attire. Much more of a relaxed, pressure-free environment in stores like Apple where clothing is less formal, and staff are wandering around the shop floor looking to engage. Great plan in my book. This is actually what AT&T has been doing in their stores since last Spring/Summer. I get the inside information on when the slow times are in the store, so my waits are usually not long at all. We do have twice the customers tmobile has…. The ipads are amazing tools and make your life way easier…I’ll be lucky to use a computer once in a given day save to check my email maybe but that’s it. Computers are a thing of the past to att reps.
100% agree with you Cam. Less formal, more accessible is a win/win; especially in a commission-structure environment. Would you want to be seen as more approachable and less formal if your paycheck was, in great part, your sales? It makes sense. I think it should be any t-mo shirt and black/blue jeans… sneakers should be fine, as mentioned, since that is the model John is setting. It’ll clearly be the hippest of the carriers. Too bad Carly isn’t around anymore, she’d look great in jeans!!! It’s an attempt to make the process less formal and intimidating. Polos and slacks are kind of the uniform for your traditional “Don’t worry, it’s a bundle, upsell, 2-year contract” kind of salesperson. That is associated with mistaken bills, bad information, and the overall prblems that people have with the wireless industry. It’s not an attempt to “copy” Apple, but the idea behind it is the same. We’re moving toward a more casual implementation of our computing devices. No longer is buying a phone a serious, 2-year contract, I-brought-my-whole-family-in-for-this ordeal. Nowadays it can be as easy as walking past a store in a mall and saying “Hey, that phone looks cool.” The jeans are a way to embrace that feeling. Is this a joke? Seriously….please re-read what you just wrote. i dont get your comment. why is he wrong? Why don’t they really change things up a bit and stop paying their employees commision and pay them a higher hourly rate. That would completely seperate t mobile from the rest even more. Getting payed commission is good for business but bad for the customer and the employees. That is the worst idea I’ve ever heard. Look how well that’s worked for other companies…. The economy isn’t great as it is, and you want them to pay me less. We make the majority of our money on commission. If they were going to pay me hourly to make up for it, I’d need to get 25-30/hr. Stephen: How does the commission structure work? Do you get a set dollar amount per device sold? Is there a difference in commission between devices brands or high and low end models? Do you get a payout for each new line commissioned? I’ve been curious about this as I don’t mind helping out a retail guy make a few bucks rather than ordering online. So it’s good for employees. In my experience it’s also better for customers. Look at the difference in service between buying a phone at Wal-Mart compared to a T-Mobile store. There are always exceptions, however the people ive worked with go above and beyond for their customers. You are making us money. It’s also incentive for us to go through everything thoroughly with the customers. The majority of customers don’t know what is available and what they need. Many don’t even know the capability of these modern devices. If you go to a person making a little more than min wage, there is no incentive to help you. And then you have Best Buy where employees have quotas and no incentive other than keeping their job to meet them. Have you ever BEEN in a Best Buy? The employees hate their lives. Thats my picture on the top of the article. Not sure how you guys got it. And the iPad isn’t a computer? The retail iPads aren’t in the sense that they don’t do the job that they’re designed to do. I was in a meeting this morning where Ami Silverman talked about these.. The problem with this is that they won’t process a transaction where a customer pays in cash. Credit cards, fine… Cash, won’t work. And you’d be surprised how many TMO customers still pay with cash. Seems like T-mo will then push hard on the Cards they announced a few weeks ago? Those were part of a test pilot and will be replaced with new iPad minis. Trust me, I set up three just yesterday, they work much better and you’ll love them. we already wear jeans on values weekends. customers don’t see us and turn around, i promise. I look foward to the updates to the Tmo uniform. I myself am not intimidated by what a saleperson wears. If it makes the salepeople more relaxed to enjoy coming to work, then great. Glad they aren’t wearing Magenta shirts. I hope with all these new POS systems, they got some backhaul on their system. My Tmobile Corporate Store needs it. They have computer POS that get constantly bogged down, or have no bandwidth to the Tmobile server most of the time. Cue the incoming comments about people jealous because they have to wear dressy clothes to work! I personally think this is a nice change that makes the employees appear to resonate more on the customer level instead of them appearing to wield authority over the customer. I’m not jealous at all. I like dressing up for work. Dress for success is what I’ve always said! Not that the old uniforms were particularly dressy or anything… I am glad to see new mobile POS systems though. Nothing worse than walking into a store with 8 or 9 sales reps and only 4 computer terminals to ring people out at. Frankly, I’m surprised it took this long! This statement about both the jeans and iPads are true. My store is located in Atlanta and we’ve had te iPad 4 for about 5 months to use as mobile POS systems but they’ve recently switched them out for the new iPad Mini. The iPads allow you to do everything you’d do at the register. I look forward to the jeans as well. I’m a basic type of person so the jeans won’t be a problem for me because I hate all the crazy stitching and patterns on jeans these days anyways. A basic pair of Levi’s or Express jeans would do just fine. We just got got iPad mini 2 retina for mobile pos with mquickview. Were in soflo. We got them at my store! Works awesome I love it! Solid Black sneakers are allowed. Check T-Community. Wearing jeans everyday is unprofessional!! !